For several years now, from time to time I have come across the repeating of a libelous statement that a Haitian political operator named Patrick Elie made about me in the pages of two fringe publications, Michael Albert’s Znet and the former Haiti Progres, which was then edited by the American Kim Ives, before the latter departed to form Haiti Liberté amid charges of nepotism and financial irregularities. As Mr. Elie, a violent and erratic individual with a history of perjury and other unsavoury activities , is such a marginal figure in Haiti's political landscape (despite his desperate courting of foreign journalists) and as Haiti has such genuinely serious problems facing it, save for two paragraphs in an article I wrote in 2006, I thought it best to just to let the matter lie. However, these years later, at the urging of some friends who continue to be concerned about the words of someone as nefarious as Mr. Elie taking root, I will take a moment here to respond in detail as I have not before. On December 3, 2002, the first anniversary of the murder of the journalist Brignol Lindor, I attended a mass at Petionville's Église Saint Pierre in his honor and the honor of all the other journalists who had died, been attacked or been forced into exile, including Jean Léopold Dominique, the director of Radio Haiti Inter slain in April 2000. At the receiption that morning were Radio Metropole owner Richard Widmayer, Radio Kiskeya programme director Lilianne Pierre-Paul, U.S. Ambassador Brian Dean Curran, then-Haitian Senate President (and future convinced drug trafficker) Fourel Celestin, Radio Haiti Inter's director (and Dominique widow) Michèle Montas and Patrick Elie himself. 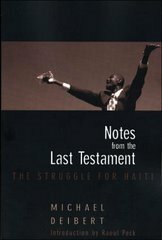 I briefly alluded to the presence of all of the above in my 2005 book Notes from the Last Testament: The Struggle for Haiti. On that day, I addressed Mr. Elie - whom I had met several times previously - by name and in English on the steps of the Église Saint Pierre. In a 2006 article on my book, a Canadian writer named Justin Podur, who had visited Haiti only once and spoke no Kreyol, made the use of an expletive-laden diatribe by Mr. Elie to claim that I had falsely stated that Mr. Elie was at Haiti’s Cathedral National that day when he was not. Simply put, this was a lie. Mr. Podur, perhaps understandably given his unfamiliarity with Haiti, had confused the Église Saint Pierre with Haiti's National Cathedral, several miles downtown, claiming that was where I had place Mr. Elie, even though my text clearly and repeatedly specified the Église Saint Pierre. Faced with their error, neither Mr. Podur nor Mr. Elie nor Mr. Albert nor Mr. Ives retreated from their libelous claim, perhaps not surprising given their respective characters and the ease with which Mr. Elie, in far graver matters, had previously veered from the truth. I don’t really remember if Patrick was on the steps but he must have been at the Eglise Saint Pierre that day. Ms. Montas never went public about the incident, nor did I ever ask her to. However, Mr. Elie still trying to pass himself off as anything but the dangerous prevaricator that he is simply won't do, I'm afraid. Had I enough money, I might indeed have considered hauling Messrs. Podur, Elie, Albert and Ives to court [these people generally attack those without the means to fight back] but, then again, if I had that kind of money it would not doubt be better spent investing in something that actually improves the lives of Haitians, such as the micro-credit institutions FONKOZE, rather than settling scores with dilettantes and political opportunists who discredited themselves long ago. Attempting to smear someone’s reputation when they threaten powerful forces - in this case former Haitian president Jean-Bertrand Aristide and his lavishly-funded propaganda machine in the United States - is a very standard trick, one which Mr. Aristide used himself against opponents as diverse as former Port-au-Prince mayor Evans Paul and peasant leader Chavannes Jean-Baptiste. I have watched the endless attacks against journalists whom I much admire in countries where I work such as Haiti and Guatemala and, quite honestly, in an odd way, I feel somewhat honored to be considered important enough to be in their company. By using Mr. Elie - a man with a documented record for rather creepy and potentially lethal plotting - to attack me, people like Justin Podur, Michael Albert and Kim Ives no doubt believed that they would succeed in intimidating into silence my voice in the debate on the fate of Haiti and it’s long-suffering 9 million people. In this, as in engaging in a meaningful debate on issues such as how we restore Haiti’s peasant agriculture, fix its school system and provide it with a responsive political culture, they failed. But, anyway, for the record, there it is, the brief and rather boring story. I think that's about all the mention it deserves going forward. 1. Mr. Elie was arrested outside of Washington, DC in April 1996 and jailed in the United States for, among other offences, apparently threatening the life of Haiti's ambassador to the United States at the time, Jean Casimir. Subsequently convicted for falsely claiming to be a diplomat and for using a false address on a federal firearms transaction, court documents (from the US Court of Appeals for the Fourth Circuit) show that US diplomatic security and police inventoried from Mr. Elie's hotel room at the time of his arrest a Colt .223 semi- automatic assault rifle with a round in the chamber and six magazines loaded with armour-piercing ammunition, a Remington .22 calibre bolt action rifle equipped with a telescopic sight, a loaded Steyr 9mm semi-automatic pistol with 264 9mm rounds (including 180 rounds of hollow-point ammunition), night vision equipment, two knives, approximately $4,800 in cash, purchase receipts for three additional firearms and documents relating to the activities of Mr. Casimir. Mr. Elie's connections among Haiti's elite economic and political class saved him on that occasion, but one cannot help but to speculate as to what exactly was being planned.